3) Find the page you want to add a template to and click the edit icon OR click "Add Page"
5) Select the template you would like to use, for this tutorial I selected "Two Column 25-75"
6) Type in your content, you can also add images, links, videos, etc. 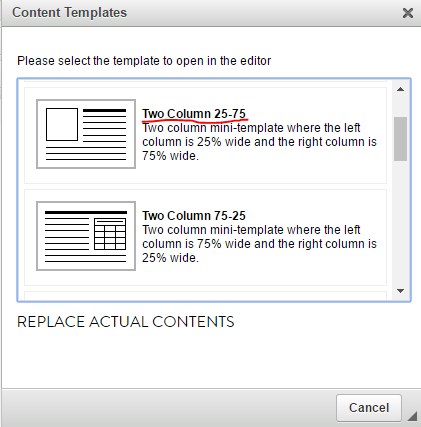 Note: Please do not delete the "left column" or "right column" text before you add some of your own content, otherwise the cell/box will disappear. If you accidentally delete a cell/box, select Ctrl+z (Windows) or Command+z (Mac) to reverse your last action. 7) To add another template, click anywhere outside of the dotted lines of the template so that your cursor is outside of the row you just added. 8) Then repeat steps 4-6. In the following screenshot I went through steps 4-6 using the one-column template. 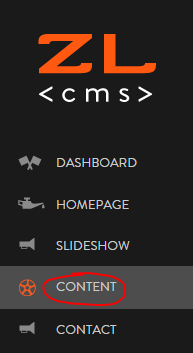 Once you have entered all of the content you want, click "Save Changes" at the bottom of the page. Review your page on the frontend of the website to make sure it looks exactly how you want it to.